This past Saturday, we had a date night that included a trip to the movie theater for our first movie in months. It is harder now to just head out the door and catch a movie. The process now involves baby sitters, formula, and diapers. We did get a sitter for the night and headed out on our date night. The movie was pretty good, and it got me thinking. Everyone's searching for something. 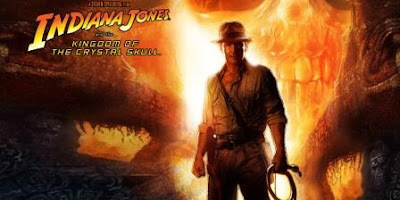 Indiana Jones is searching for the next great discovery of an ancient artifact and more knowledge. Irina Spalko is searching to find the next great power, the power to control other's minds. Professor 'Ox' Oxley is also searching for the next great discovery. 'Mac' George McHale is searching for gold, lots and lots of gold. Everyone wants something. This is common even with those not in Indiana Jones 4. Sometimes we search for a successful job, a 6 figure income, the perfect wife, the perfect car, the latest and greatest electronics, the respect of our peers, the respect of our parents, etc....The list continues forever. There is only one thing we all should be searching for. The bring the most honor and glory to our Father. We should all be searching for this and this along. I know that searching for this makes all the difference.